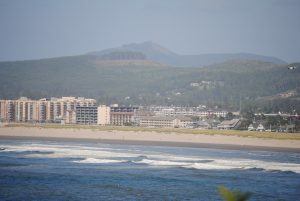 Seaside is considered by many the original Oregon Coast beach town. Just 1.5 hours from Portland, Seaside Oregon has some of the finest real estate properties on the coast. From commercial income properties to high-end beach homes Seaside has it all. Seaside, Oregon, on the northern tip of the Oregon Coast, is a quaint tourist destination right off the beautiful Paciﬁc Ocean. Seaside is derived from Seaside House, built by Ben Holladay in the 1870s as a historic summer resort by this railroad magnate. At 4.14 square miles, and a 2010 census population of 6457 residents, this area in Clatsop County may not be immense in size, but nevertheless offers visitors to the area a wide variety of ocean front houses, vacation homes, rental homes, condos, and other properties available for leasing. The geography of Seaside and the beaches of Clatsop Spit provide a fertile environment for the formation of Paciﬁc Razor clams, totaling millions annually, bringing thousands of visitors to Seaside Beach every year. Popular attractions in Seaside include The Miss Oregon Pageant, preliminary to the Miss America Pageant, which takes place annually at the Seaside Civic and Convention Center. Seaside’s annual 4th of July celebration, one of the largest ﬁreworks displays on the west coast, includes outdoor concerts and a parade. For jazz fans, The Seaside Jazz Festival features some of the most popular Jazz and Swing bands in North America. And the proximity to the ocean makes a visit to the Seaside Aquarium a popular visitor destination. For travelers interested in vacationing or owning a property in Seaside, there are really great options in rental properties and ownership options in the area. One terriﬁc way to learn more about these properties is to do research on the internet. Quality sites, like Oregon Beach Vacations, offer comprehensive information, photos, prices, availability, and much more on their extremely easy to use and access website. In terms of vacation rentals, companies that have detailed listings on these properties will include new properties, luxury properties, oceanfront homes, condos, pet friendly properties, and hot tub properties, all in a variety of locations in the area. Specials will be featured, as well as area information to further enlighten potential visitors as to what the region has to offer. One ﬁne example of a luxury vacation property able to be rented out is the Seaside Ocean Vista, a gorgeous three bedroom, three bath house that can accommodate nine guests. With breathtaking views that include a historic lighthouse and Tillamook Head, the outside deck has a BBQ, as well as a private trail that leads directly to the beach. Among the many amenities provided, they include Cable TV, DVD Movies, DVD Player, WiFi, washer and dryer, and a full complement of kitchen appliances. Another popular rental location in Seaside is the Orca Beach House. This home with an ocean view has two bedrooms, one and a half baths, and can sleep six. This new listing features hardwood ﬂoors, as well as a fully functional ﬁreplace. There’s a patio, providing beautiful ocean vistas with the local Promenade a popular area to visit, a short walk from the home. If visitors are interested in a hot tub experience in a beautifully restored 1920s-era home, they should look at the Saltworks Seaside Cottage, located a mere 50 yards from the Lewis & Clark Salt Works. This quaint 1000 square foot cottage, just one block from the beach, has three bedrooms, two baths, and sleeps up to six. The newly installed hot tub is accessible through sliding doors through the master bedroom and dining area, leading out to the deck and private back yard. There are a number of pet friendly locations for visitors that want to include all members of the family in their travel plans. One location in Seaside that permits pets is the Seashell Beach House. This newly renovated two bedroom, one bath house sleeps six, with the view of Beach Access. Cartwright Park is located right across the street, a popular place for kids and pets. The beach is four blocks away, enjoyed by visitors swimming, ﬁshing, and clamming. Condominium rentals on the beach are terriﬁc ways to get terriﬁc oceanfront or bay front views, right there on the coast. In Seaside, the Seaside Beach Club, located on the Promenade, is a popular rental choice. Located near the city’s food and shopping centers, every condo in this complex offers a breathtaking view of the coastline. Typical rentals here feature one bedroom, two baths, and sleep six.